That time of year again, MOT due. You know the bike should be fine, you know you’ve serviced it well and checked it over thoroughly yourself. 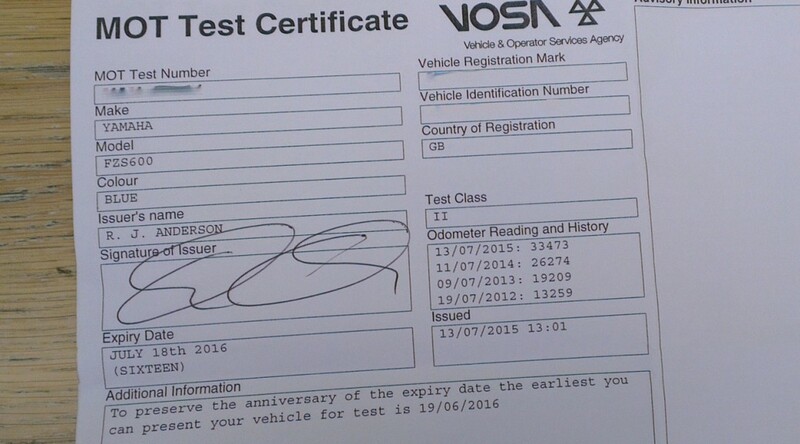 But still, there’s that little niggle of doubt over whether it will fail the MOT on something. Thankfully my trusty Fazer passed without a hitch with no advisories at all. Sorted. Checking out past MOT passes, it seems I’ve put on 7200 miles in the last 12 months. Not too shabby at all really. A little more than previous years, but I have been doing a lot more riding for my IAM course. On a side note, a thumbs up to London Scooters for turning the MOT round super quick in my lunch break. They’re just around the corner from my workplace, so super handy for me. Edit: I took my wife’s CBF500 to London Scooters in May 2016 and received less than satisfactory customer service. Please see this video here. Previous PostCommute Delays in LondonNext PostIAM Skill For Life Test Passed – Yippee!